Final Fantasy IV (known as Final Fantasy II when first released in the US) is the fourth game in the Final Fantasy series. The plot follows the quest of Cecil, as he seeks to recover the magic crystals in order to save the world from the evil that seeks to destroy it. It was first released on the SNES in 1991. Critics complained that the poor translation of the English SNES version coupled with the less challenging gameplay made it inferior to the Japanese original. 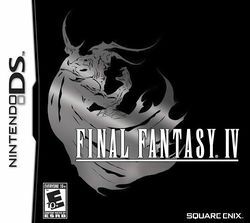 It has since been re-released in the PlayStation compilations Final Fantasy Chronicles and Final Fantasy Collection, on the Game Boy Advance as Final Fantasy IV Advance, and on the PSP as Final Fantasy IV: The Complete Collection. A Nintendo DS remake has also been released, featuring 3D graphics and additional content. This page was last edited on 30 May 2016, at 05:17. This page has been accessed 185,723 times.